Learn to knit a scarf in a day? Easy. 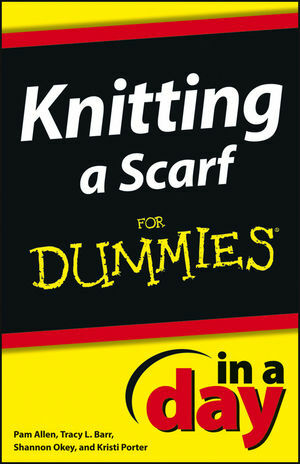 Want to know how to knit a scarf? The secret's out—you can learn to do it in just a day with the help of this fun guide, no matter your knitting experience. This handy little guide gives you a clear understanding of the essential steps and techniques involved in creating a great scarf! You'll get a friendly, hands-on introduction to basic knitting techniques, tools, and terminology, as well as detailed coverage of the most common stitches. Plus, you'll get a list of recommended beginner routines and advice for fixing common mistakes. Get ready to keep those needles clacking as you knit a fabulous handmade scarf! Pam Allen has been designing sweaters since 1985. Her patterns appear in Vogue Knitting, Family Circle, and Women's Day, among other publications. She is the author of the best-selling Knitting For Dummies. Shannon Okey (Cleveland, OH) is the author of nearly a dozen books on knitting and other fiber arts, a columnist for knit.1 magazine, and a frequent contributor to other craft magazines. She hosts a call-in podcast about knitting and has appeared on many television shows, including Knitty Gritty, Uncommon Threads and Crafters Coast to Coast. Okey can be found online at knitgrrl.com.